intending to do araathi and afterwards incense the house with camphor to cleanse and uplift the vibrations. I decided to pluck a card from my blue Baba bag. The quote stated simply and clearly one word: "Meditation." Well it was clear what Swami wanted me to do. So I prepared myself for meditation. First inhaling some deep alternate breaths while repeating Om, I settled into my heart center, feeling the radiating love of Sai pervading my being and then rising to the third eye center. As I relaxed into meditation I suddenly heard a loud buzzing moise and all the lights and electronics in the house went out. I got up to see what was going on. Looking outside my window I saw neighbors coming outside wondering too. I then went back into the puja room and lighting up white camphor tablets performed aarathi to our Lord Sai and incensed the entire house with Gayatri mantra. Now I was ready to really meditate. I settled back down and easily went into a nice altered state. Several times I saw our beloved Swami moving about, walking, sitting, standing generally very busy. Then unexpectedly, I saw Swami's arm projecting from my right shoulder. 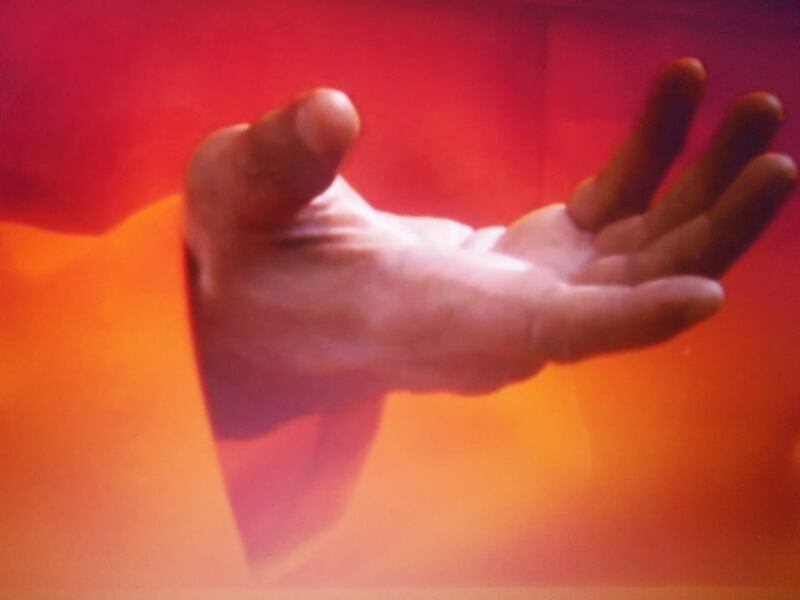 His holy hand was outstretched and appeared divinely translucent. I watched His hand for a while trying to see if He was trying to convey something to me. After some time I drifted deeper and cannot remember anything more. The phone rang and roused me from my meditation.